Todays’ POP RESCUE from a potentially loveless fate, is the 1994 debut D:Ream album On Vol. 1. This 10 track album opens with single Take Me Away, which starts with a synth and the vocals ‘c’mon and take me..‘ as if signalling the start of some kind of journey, before it breaks for some wonderful house piano and belting ‘Take me awaaaaaaay‘ vocals. The beat leaps straight in with Peter Cunnah’s softer soulful vocals. His voice is perfect for this dance-pop, and he is a great contrast to the female vocalist Linda Duggan‘s big vocals. The end result is a pretty catchy song, which became their 7th single to chart in 1994, reaching a moderately successful #18. Seamlessly U R The Best Thing comes in, continuing the big vocals (this time from D’Borah Asher) and house piano. This song does feel somewhat more mellow though, giving Peter plenty of space to show off his vocals in the verse. The song gave them a #4 UK hit in 1992, and a #19 hit in 1994. Some slightly sinister synthed chorus vocals lead us into Unforgiven. This is quite a downbeat mellow track. The vocals sound really good once their against the beats and a little harmonica line. Again Linda gets some great big vocals. For a moment from 2m 20s we kind of have a flamenco break-beat interlude before Peter takes us back for the final third of the song. The song scraped into the UK top 30, reaching #29 in 1993. Half of the double-A side 5th single I Like It follows, and this returns us to dance beat and house piano, and a distinct disco bass line (reminding me of disco classic Disco Inferno by The Trammps). At 3m 40s, the song tumbles down into a brooding electro breakdown before disco strings return it to this up-beat catchy song 30s later. Glorious comes bursting in with a flurry of house piano and beats. A wandering bassline weaves its way in, as the track takes on a slight latin sound, supported by the breathy female Spanish vocals and oodles of Spanish guitar. At times this reminds me a little bit of some of the early 90s Saint Etienne So Tough album tracks. Despite it being the longest track here (by 1s, at 6m 3s), musically it sounds really nice that you don’t notice it. This is followed by So Long Movin’ On, and this is quite a mellow track, and musically and lyrically it is probably the weakest link here so far. Peter’s vocals don’t sound as comfortable and confident – definitely a filler. Next up is Picture My World which starts with some lovely affected synths, and is soon joined by some crisp percussion and piano. The full beat soon arrived with the bass and lead synths. The plunging piano line really sits well here, and is a contrast to Peter’s soaring vocal range. Sadly, he occasionally seems to reach just that little bit too far-ha-ha. Rain pours down at the start of next song Blame It On Me. Menacingly low strings fade in as a vocalist feintly sings in the background as if it’s sobbing. A great beat soon arrives alongside a bright up-beat piano line. At times this gives the song a kind of gospel feeling – when the backing vocals also join in. Thankfully Peter’s vocals are back on form here, and the end result is a really catchy sing-along feel good song – ‘won’t you marry me?‘ he sings… that’s just how feel good this song is! Penultimate track is THAT big hit song Things Can Only Get Better – a song that was released three times – a moderate hit at #24 in 1993, #1 in 1994 after they supported Take That on tour. Here it is in all its glory. This song has a funky saxophone, a relentlessly thumping bass drum, house piano and Peter’s strong vocals. He’s joined for the chorus by the gospel choir that was missing in the previous song. The song is thumping, almost as fresh as it sounded back then, and despite it’s over-use in the 90s, it’s still a bloody good song. The album closes with the other half of the double-A side, Star, a song that includes Professor Brian Cox on piano (always the physicist) although oddly he doesn’t appear in the video). This is a big piano ballad, and it’s perfectly tucked here at the end. Whilst it does feel a little bit like a lost Elton John song, Peter really does do a fantastic job with this song. His voice is strong and flawless here. A fantastic ending. Over all, this album is a wonderful slice of early 90’s dance pop. It’s loaded with huge vocals, house pianos and dance beats, and that undoubtedly gave it such success upon release. What’s odd here is that it took D:Ream some while to achieve their proper mainstream success from the singles.. but they got there in the end. A great album! D:Ream, went on to achieve a small number of hits with their second album World in 1995, including Shoot Me With Your Love, but it was their hit Things Can Only Get Better that they’ve become synonymous. 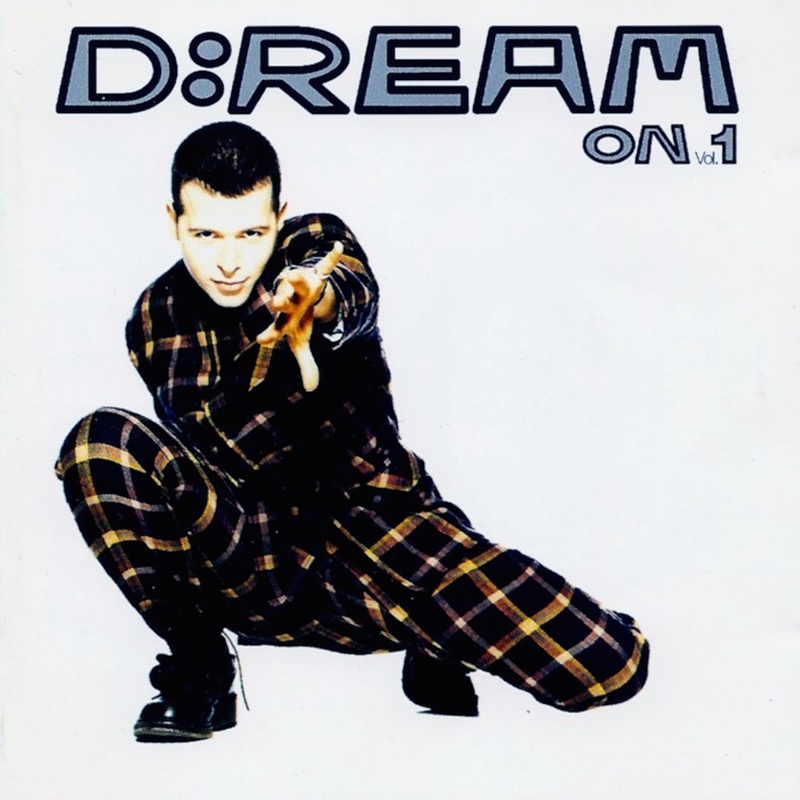 Perhaps the over-use of this song in the 90s, and it’s close associations with Tony Blair‘s ‘New Labour’ Electoral Campaign (during which it charted at #19 in 1997), left D:Ream with a tough legacy to get beyond. D:Ream parted with their record label, leaving their third album unreleased. Peter returned as the vocalist on Love On The Run, a moderate UK hit for dance act Chicane in 2003. They reformed in 2008, and released a new single All Things To All Men in 2009 taken from their 2011 album In Memory Of…. Brian Cox returned to the studio to record keyboards on the album’s third single Gods In The Making, but sadly it failed to chart in the UK. Posted in 1990s, D:ReamTagged 1997 General Election, Blame It On Me, D'Borah Asher, D-Ream, I Like It, Labour Party, Linda Duggan, On Vol. 1, Peter Cunnah, Professor Brian Cox, Star, Take Me Away, Things Can Only Get Better, Tony Blair, U R The Best Thing, UnforgivenBookmark the permalink.